I do this thing, every year, for both you and your sister. I sit down at the computer on the day before your birthday and I reread the stories of your birth and the letters that I’ve written to you throughout the years. I catch myself throughout the day remembering. Where I was that day so many years ago. To type “so many” when I mean just three seems silly and perfect at the same time. So, so many. So many years you are, so many more you will be tomorrow. You do not know how so many will tug, tug, tug at my heart and fill my eyes as I watch you blow those candles out. You may know, a little bit, when you are old enough to read these letters. You will truly know if you ever hold a little one in your own arms. I wish this kind of joy for you, if not by that vehicle, then by another. It is the most joyful of all joys to know. I did not come that day to purchase a birthday card for you. I came for an entirely different purpose, and for once (in a great blue moon), you were not with me in that art store. I can tell you now – without hesitation or fear of hurting your feelings – that not having you there with me was a delight. I could focus on my small list, I could linger and browse at will, I could take my purchases to the counter and complete a transaction that included brief but polite conversation without having to once excuse myself from the task at hand to steer you (most unwillingly) away from all that is expensive and breakable and damageable and loud, and also that parking lot on just the other side of those automatic doors. When you are with me I do just that. A lot. You cannot help yourself. Everything is so touchable and explorable and far more exciting just around the corner and ever so slightly out of earshot. I’ve known you for three years now, and several months even before, and so I know this. It is lovely and exasperating at the same time. Everyone stops to watch you where you are. They smile and comment on your adorableness, they smile and comment on my lack of control. They always smile. That’s who you are. I bask slowly in my art store freedom and I see a card with rainbow colored hues. It is a quote by Louisa May Alcott, which instantly recalls the countless hours I spent as a child devouring every book that bore her name. There is an entire carousel of cards with quotes, but the majority of them are black and white, and this one is the only one in rainbow colors. Like your party. The party that you’ve imagined and created and talked about for months on end. I find myself using exclamation marks sparingly; I don’t particularly enjoy reading sentences that end with them, and am completely turned off when they appear in duplicate or triplicate. An exclamation point should mean something. If you over use it, how will anyone really know when the wolf is among the sheep? But now I’m staring at this card and this giant red exclamation point and I’m hearing your voice as you talk about the beach! and the concert! and your sissy! and rainbow parties! and three! and you punctuate your conversations in a way that is so very, very you. 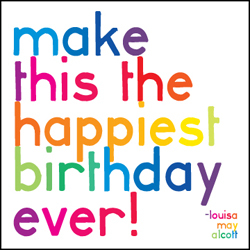 This will be the happiest birthday ever! because you know that it is. You were born with the gene for ripe anticipation, you are hardwired for expectancy, you are the very definition of wonder. This will be the happiest birthday ever, and so will the next and the next and the next. I can say this with confidence because I know you. You are the only person that can demonstrate the entire range of emotions within a single day, an hour, a minute. I know that when you wake up each morning that sometime during that day you will be the loudest you will ever be, the sweetest you will ever be, the maddest and the smartest and the funniest and the sleepiest and the most focused and distracted ever! You will exasperate and delight us in the span of a single breath and we will marvel at how we ever truly lived without you and at the same time remember fondly those quieter, more predictable days before you burst onto our scene. I went upstairs to hold your sleeping two-year-old self one last time. Your legs wrapped around my hips, and your head lay across my chest. Too tired for even your thumb, you let your arms fall to your side and mine, and then wrapped them briefly around my rib cage before releasing them again in sleep. I slowed my breaths to yours, and held you tightly, for you make me the happiest ever. Happy birthday, my sweet, sweet girl.